Los Donneños perform in 2014. This week, we’re going to have a round-up of some of the most anticipated Tejano, conjunto, and cultural events of the month of August, along with some news of upcoming conjunto festivals for the months of September and October. 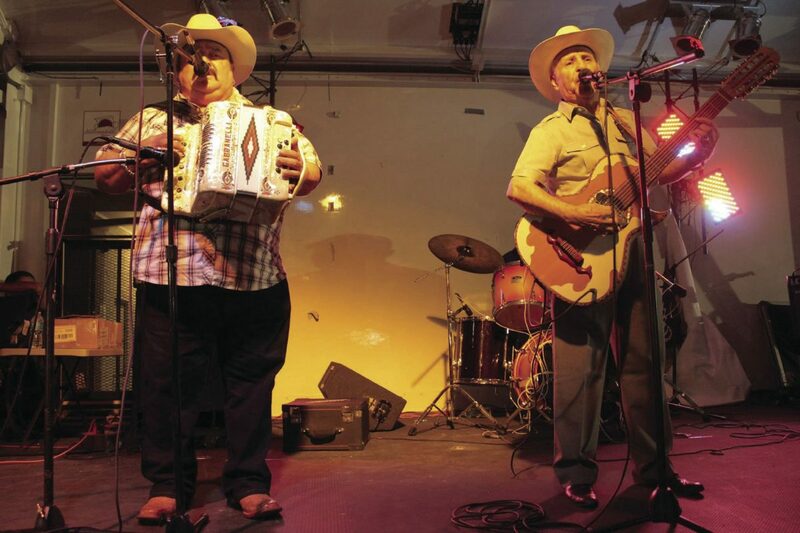 >> South Texas conjunto legend Pepe Maldonado has lined up the month of August with another quality list of top conjunto acts from the Valley and beyond. Thanks to Joe Maldonado for reaching out and always letting me know the upcoming schedule. These are the following acts scheduled for this month of August: Briana y Lokura and Javier Solis y Los Unikos on Aug. 13; Ruben Garza y La Nueva Era and Los Originales on Aug. 20; Boni Mauricio y Los Maximos and Ricardo Guzman y Los 3 Aces. The first show of the weekend will also be a birthday celebration for Gilberto Perez, who turns 82. One of the great conjunto legends of all time, and everyone is inviting to come celebrate the occasion with the iconic accordionist from Mercedes. Entry fee is $10, and the music starts at 6 p.m. every Sunday night. For more information on these upcoming events, you can visit https://www.facebook.com/lalomitapark?fref=ts or call La Lomita Park owner and promoter Pepe Maldonado at (956) 867-8783. >> Marco Orozco y Grupo Rebelde and Hector Gonzalez y Conjunto X2G will be playing at the Outta Town Dance Hall in Mission on Aug. 12. Tickets are $15 presale and $20 at the door, and it is BYOB. For more information, call (956) 584-1812. >> On Saturday, Sept. 2, the 7th annual Freddie Gomez Memorial Conjunto Concert will be taking place in the Historic Brownsville Downtown District, between the Capitol Theater and El Jardin Hotel. The theme of the event is “Sons of Conjunto Legends,” and will feature performances from Gilberto Perez Jr. y su conjunto, Ricardo Guzman Jr. y Los 3 Aces, and Santiago Jimenez Jr. y su conjunto. There will also be a “So You Think You Can Dance Conjunto” competition, a 20-plus minute dance marathon where participants will dance in different conjunto styles and rhythms like vals, bolero, redova, shotiz, cumbia, polka, and finally, a huapango. The event is open and free to the public, and is being organized by the South Texas Conjunto Association (STCA) Brownsville Chapter. >> The 26th annual Narciso Martinez Cultural Arts Center Conjunto Festival is taking place on Oct. 20, 21, and 22 in San Benito, and the line-up has just been released. Acts that are currently scheduled to perform over the course of the three days include: La Naturaleza, Juan Lugo y Su Conjunto, Conjunto Aztlan, Los Layton, Bene Medina y Conjunto Aguila, Eva Ybarra y Su Conjunto, HACHE 3, Conteno, Epi (Martinez) & Friends, Da Krazy Pimps, Los Texmaniacs with Flaco Jimenez, Los Donneños, Bernardo y Sus Compadres, Linda Escobar y Conjunto Amable, Los Latinos. This will be Flaco Jimenez’s first performance in the Rio Grande Valley in many, many years. Also I strongly encourage everyone to check out Los Donneños if you have the chance. Ramiro Cavazos is 90 years old, and is one of the pioneers of border music in this area. A true living legend who has been carrying the flag for this style of music since the 1940s. Finally, also can’t stress enough how amazing Eva Ybarra is. One of the greatest accordionists of all time, and it’s always a pleasure to see her perform live. So far, this looks like a great line-up and something I’m very excited about the Fall of 2017. For more information on this festival and for updates about the conjunto nights the center does on every Thursday of the month, call (956) 367-0335 or (956) 571-3325. >> Los Fantasmas del Valle return to Pharr on Aug. 20 at the Montecarlo Ballroom. The legendary conjunto has been playing music since the 1960s, and has represented this style of music at the Smithsonian Folklife Festival in the past. One of the greatest conjuntos of this area, and one of my favorites as well. For more information on this event, call (956) 787-3385.